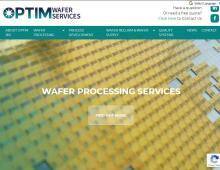 Optim Wafer Services are a company who have been providing wafer reclaim and wafer processing services for over thirty years offering businesses a bespoke solution based on their requirements. Optim Wafer Services is located in the Rousset region in the South of France which is where 40% of the French semiconductor manufacturing takes place. Optim Wafer Services also provide technical support and offer a high quality service to their customers tailoring their service to specific customer’s needs and requirements.